a legit excuse | Priya the Blog | life & style in Nashville & beyond! Well, hi. I guess I've been a little M.I.A on perfectly PRIYA lately, but it's because...I decided to add "trip to the ER" to my list of fall date ideas! So yeah, I've been in the hospital all week. Very long story very short, I was having weird symptoms at the start of the week, which got a lot worse by Tuesday afternoon. Hunter took me to the ER, where eventually I got a spinal tap to test for meningitis, because my symptoms were similar. Thankfully, no meningitis, but they told me I had a Urinary Tract Infection. I returned home late Tuesday night tired, sore, and still feeling bad, but armed with antibiotics and ready to rest. Wednesday was a lot worse. I hadn't been able to slept all week, I was nauseous and had no appetite, was switching between fever sweats and shaking chills, and my neck ached. When I took my medication, I wasn't able to keep it down, so very reluctantly, I headed back to the hospital. Wednesday night we waited in the ER from 7 pm until 1:30 am as my fever climbed up (they kept taking my vitals). By the time I was seen, I was so relieved, also very dehydrated, and feverish. By Thursday morning, I was moved into a room upstairs with a new doctor and new nurses, and a new diagnosis: pylonephritis, which is an infection in your kidneys. 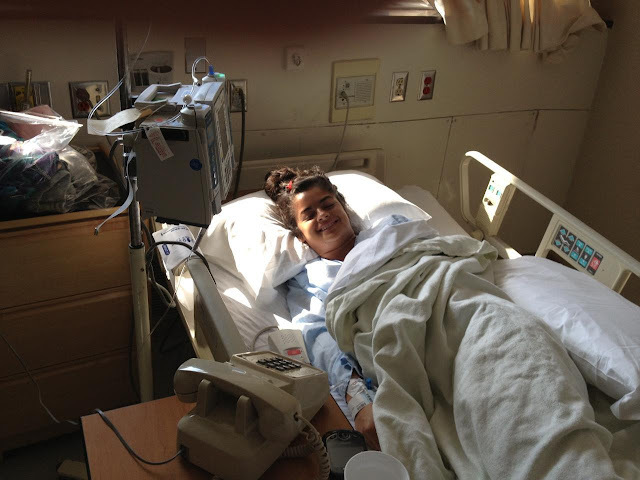 Basically, I had a UTI, which traveled up to my kidneys, so now I have a kidney infection. Which explains the crazy symptoms. Thursday was spent trying to sleep, getting more blood taken, eating popsicles, and getting visited by friends. I was initially hoping to be home by Thursday night, but my fever spiked really high several times, which meant I needed to stay in the hospital. By Friday morning, I had slept, was no longer dehydrated, and was feeling loads better. Since I started to get restless and bored in the hospital (and turned on the T.V. for the first time!) I knew I was ready to go home. I've really been laying low all weekend, which is SO difficult for me who always needs to be doing something! It's hard to remind myself that I just need to rest, and that's ok. 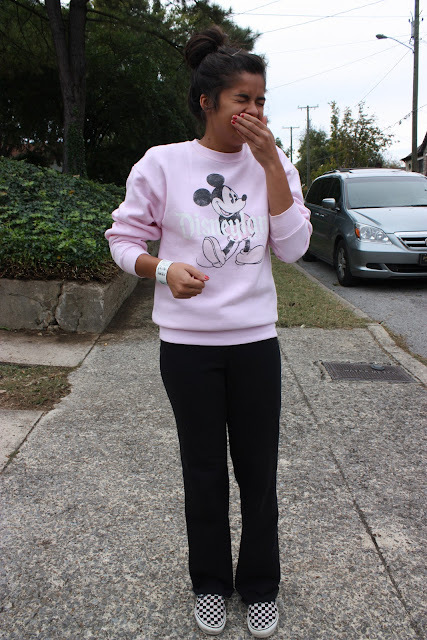 But I figured I could get one outfit post up for you guys! I've just been wearing sweatpants. And this is me actually coughing...thanks Em. Since then I'm feeling even better, and trying to (as I've been saying) "get my life back." Which is kinda scary considering how much schoolwork/rehearsal I missed last week. - I am so thankful it a) wasn't meningitis and b) is something treatable and not that bad. - Like most things, I never appreciated my health that much until it wasn't there. Man, we're lucky to be healthy. And have accessible hospitals. - Going to the bathroom with no I.V. is SO easy and fun! - Thinking about all the people that loved and cared for me (especially my own mom...who seriously was going to fly out several times) and ALL the people that said "Let me know if you need anything." makes me emotional. Because, that's lucky. Thank you everyone who thought/prayed for me. - Minus the feeling crappy part, being at the hospital isn't all that bad! I had all the popsicles I wanted! It's good to be back to my normal, crazy, busy self. Now can somebody give me credit for being the most fully disclosed blogger for sharing that awful picture of myself in the hospital?! Get well soon! Much love! I was praying for you last week as your mom kept us updated! Very thankful you are ok. Thank you so much Elana! And thanks, that works, it's the thought that counts! Now I'm gonna pop over to your blog!! Saw your message on HisList too. Thanks for your prayers Joanne! Hope you already feeling better!? Priya! I'm glad you're feeling better and are home free :D Strange illnesses can be so nerve racking! Oh my goodness! So glad to hear you are feeling better now, that is quite scary. Welcome back to the blog, I missed ya last week! PRIYA! so glad you are okay, so scary though. Wish I could have come visited you and brought you some ginger snaps. Love you! Thanks RayMo! I'm glad you're still alive too, actually! And I would have loved some of those gingersnaps!! Thanks so much Jenny! And glad to hear I still have friends even though I've neglected the blog, ha! Thank you Alexa! I dunno about stunning, but glad to know I don't look entirely repulsive! Thanks for your sweet words! Chloe! Thanks so much! Yup, looking back it was very nerve racking! So glad everything is normal again. Yes, I think a thank you post is in order! Especially since he is such a huge part of it! I am feeling much better, thanks Larissa!